A year after my first foray into Mexico, I once again had the chance to spend Christmas there. The year before I stayed first in Cancun and then in Akumal (an hour south of Cancun), this time I went only to Akumal with the aim to get as much diving done as possible. 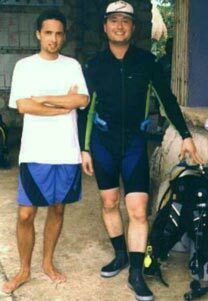 My brother, who joined me and my parents in Akumal, was eager to learn how to dive, too. I knew from my stay the year before that the AKUMAL DIVE SHOP, one of the oldest dive outfits of the area, is located by the main beach of Akumal. It is quite small and the staff are extremely obliging towards their customers' wishes. I had contacted them before my trip and was well impressed, by how quickly and comprehensively my questions, e.g. about equipment or my brother's OWD course, had been answered. Students get a roomy locker for free for the duration of their course, and everyone else can rent one for (at the time) $ 1 per day. Free storage space for wet suits etc. was also available. In front of the shop there is a blackboard where you can sign on for the next day's dive trips. For the actual dive you just turn up half an hour in advance, get your weights, bottle and whatever else you need, kit up, walk down to the beach and get on board the boat. 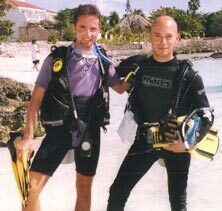 My brother and his instructor David after Oliver's first open water dive! The dive shop offers several dive packages, which depending on the number of dives booked, reduce the price of the individual dives. I had decided to go for the 10 dive package, which offered excellent rates without the need to go diving three times a day. When I arrived and registered I put the $ 200 for that package on the counter. This baffled the guy at the reception desk - he said normal practice would be to just dive and accumulate dives. At the end of your holiday you then just check which package suits you best. This I found en excellent and extremely customer-friendly approach! Nevertheless I paid the money up front as I didn't want to have that much cash lying about at the condo.